Good news for fish lovers. A new study published in the Journal of Human Nutrition and Dietetics reports that consumption of fish as a part of a healthy diet helps lower asthma symptoms in children. Eating fish such as salmon, trout, and sardines followed by a healthy Mediterranean diet improves lung function in children suffering from asthma. “We already know that a diet high in fat, sugar, and salt can influence the development and progression of asthma in children and now we have evidence that it’s also possible to manage asthma symptoms through healthy eating,” said Papamichael, the lead author of the study. “Fatty fish is high in omega-3 fatty acids which have anti-inflammatory properties. Our study shows eating fish just twice a week can significantly decrease lung inflammation in children with asthma,” she added. “Following a traditional Mediterranean diet that is high in plant-based foods and oily fish could be an easy, safe and effective way to reduce asthma symptoms in children,” said Professor Itsiopoulos, the co-author of the study. Papa Michael and associates conducted single-centered, 6‐month, parallel randomised controlled trial to compare the consumption of a Mediterranean diet supplemented with two meals of 150 g of cooked fatty fish weekly (intervention) with the usual diet (control) with respect to pulmonary function in children (aged 5–12 years) with mild asthma. The study participants were divided into two groups and around half were instructed to eat two meals of cooked fatty fish (of at least 150 grams) as part of the Greek Mediterranean diet every week for six months. The remaining children followed their normal diet. The study found that the group who ate fish had reduced their bronchial inflammation by 14 units. Above 10 units is significant under international guidelines. The study concluded that a Mediterranean diet supplemented with two fatty fish meals per week might be a potential strategy for reducing airway inflammation in childhood asthma. 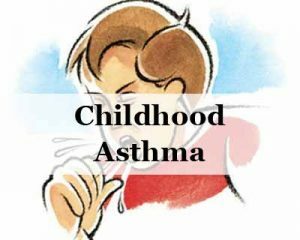 Childhood asthma is the most common respiratory disorder worldwide which is associated with increased morbidity and a decreased quality of life.